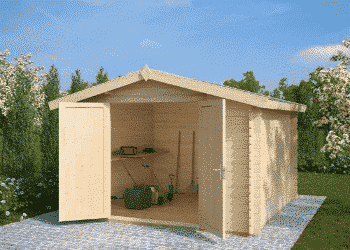 Which Is the Best Process of Building a Wooden Garden Shed? Garden sheds come in all possible shapes, designs or materials. A garden shed is typically a single-storey wooden house that is often in back gardens. Small structures will mostly serve storage purposes and larger ones can even be inhabited. In the following article we will give you an overview about everything you need to know about garden sheds in the UK including how to build one, prepare a foundation, insulate and heat your garden shed. Of course, there are garden sheds that are built from bricks or any kind of building blocks. If you want to build one of these garden sheds, you will have to invest much more time than you would need for just purchasing a ready-made shed and erecting it following a manual, have it brought there by some heavy cranes or welded together by a construction crew. These smaller garden sheds are more lightweight than the traditional wooden sheds. Which means, you might be able to reconsider their location and put them somewhere else after some time. However, it also means that they should be properly anchored to prevent them from being blown away during heavy storms. Manufacturers of both types claim a long, maintenance-free life span. But can this promise be trusted? For steel, it is just the protective surface layers that protect it from rust. Wherever this is damaged, like for example at the doorstep or windows where parts rub across each other these protective layers won’t stay for long. Of course, it is also not possible to just quickly drill a few holes into the walls to attach a shelf or a hook rail for some tools because rusty areas will form around the drill holes. Some plastic sheds boast UV-protection. However, what makes plasticizer damp out of the material is not UV-radiation but simply heat. The smell that you have, when you open such a plastic shed is just that: plasticizer that has damped out of the walls. Sheds from steel or plastic are almost never employed for usages that involve longer stays like you would have in workshops, fitness rooms or saunas and are surely not fit for guest rooms or to live in permanently because both materials are not breathable, and they have little to no temperature insulating capacities. From the point of looks, both these kinds of garden sheds may look pretty, when you see them first, but their looks will wear off with the time and other than with wooden garden sheds, you can not simply paint them over with a new colour. See also our article on which material is best for your garden shed. Wooden garden sheds come in all sizes, designs and styles from modern over traditional to picturesque, when you think of hexagonal or octagonal garden rooms or gazebos. Timber is a natural material that fits well into the background of the garden and it can be painted in any colour that makes it fit best into the environment, be it in the lush gardens, by the pond, or next to the house. Wood needs some proper care, mainly it should be kept dry or protected, but it has some big advantages when it comes to inhabitation. As we all know, wooden houses, like log cabins are often inhabited and their residents are mostly very happy about the micro-climate, the cosy atmosphere, the smell of resin and wood in their homes. Wood is an excellent natural thermal insulator and it also can take up moisture from the air and release it when it gets dryer again. The results are balanced temperatures and air moistures inside such wooden buildings. can well be used as work shops, studios, or any purpose that would require longer stays inside. Such a garden shed can serve as a garden lounge, a garden office, a garden sauna, a guest room, a private fitness centre, or as a multi-purpose garden room, which is in fact the most frequent type of usage. Of course, they can also be used as holiday lodges or to spend a weekend somewhere in nature or even to rented them out to paying guests. When it comes to storage space, you must decide how important the micro climate inside the shed is for you. Storing materials that don’t respond well to moisture might require a wooden shed to be on the save side for bikes, cars, paper materials or anything that could rust. Of course, a typical garden shed will be used as a hub for the gardening. It will contain the gardening tools, materials, soils, all kinds of accessories and everything used in the garden that should not lie around in the open from toys over wooden things to harvests. with large floor to ceiling windows will also be ideal to store frost sensitive plants during the winter or cultivate microgreens in them for salads and smoothies during the cold season. Every DIY-er has the necessary tools to extend his wooden garden shed. Make an attic under the gabled roof, extend the roof overhang to the outside to give a bicycle a dry home, install shelves or a workbench, install an insulation and so much more. All this would be much more problematic in a shed made from steel or plastic. Fixing a hook rail to the wall, installing a lamp over the work bench, building a deck in front of the entrance. Timber is the right material for all that love doing some DIY-stuff. If you are looking for a true multi-purpose garden shed, have a look at our garden rooms with shed. Here you have a contemporary presentable garden room to use as a garden office or to welcome friends and a shed for gardening under the same roof. While we would not recommend trying to build a new garden shed from scratch unless you really have a lot of spare time, and you really know what you are doing, we do offer a manual on how to build your garden shed from a package of prefabricated building parts that need to be assembled properly. But first steps first: If you plan to purchase a garden shed, the first thing would be to choose a good place, see how it matches the planning permission and then lay a proper foundation for your garden shed. As a next step, you might want to expand the usage period from summer to all-year-round by insulating your garden shed and consider the way to heat your garden shed that satisfies your needs best.